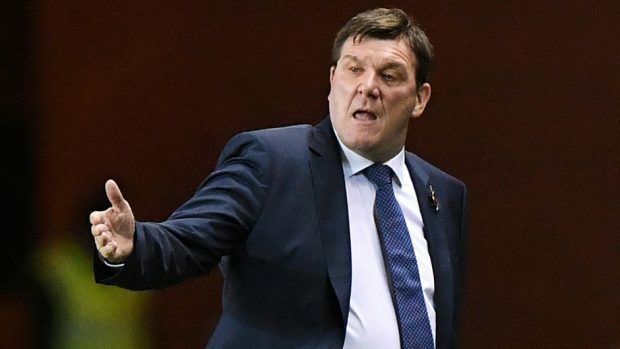 St Johnstone manager Tommy Wright could be a contender if McInnes joins Sunderland. Former Aberdeen manager Jimmy Calderwood believes St Johnstone’s Tommy Wright is the ideal replacement for Derek McInnes. Championship side Sunderland yesterday agreed compensation with the Dons, allowing McInnes and his assistant Tony Docherty permission to discuss terms with the Black Cats. A gloomy day for the Dons support was made worse when the club later accepted a £1.3million bid from Celtic for midfielder Jonny Hayes in a deal which will also see Hoops’ Ryan Christie return to Pittodrie on loan. The Dons insist they will not give up on their manager without a fight and are ready to make McInnes the club’s highest paid manager with the biggest budget in the Reds’ history in an attempt to keep him at Pittodrie. Director Dave Cormack insisted the Dons would do all they could to keep McInnes at Pittodrie and “would move heaven and earth to try to get him to extend his contract” which runs until 2019. But there appears to be only a slim chance of that happening with McInnes set to land the £900,000-a-year job at Sunderland. Calderwood reckons St Johnstone manager Wright should be top of the Dons’ shortlist if McInnes departs. He said: “Aberdeen should look for someone with experience. “Tommy Wright ticks a lot of boxes for me and I would hope he is under consideration. “He is popular with his players and he is fantastic at St Johnstone. I’m not sure how much more he can achieve there. “St Johnstone have certainly given Aberdeen plenty of problems over the past couple of years. “I hope he gets it and I think he deserves a chance. The Dons finished second in the Scottish Premiership and reached two cup finals last season and Calderwood believes whoever succeeds McInnes has a hard act to follow. He added: “Derek has been a brilliant manager for Aberdeen. “It is a great club with a brilliant support and I had a wonderful time there. “It is sad for the Aberdeen supporters because Derek did so well and now they have to start all over again. “The chairman and the board will be looking at replacements.